As usual, leaving an indelible mark as Chairman of the 20th Law Commission of India, Justice Shah just finished his term completing the 3-years on this 31st August. Though he could not make it to the Supreme Court, thanks to the ‘collegiums’, he carries much aura and commands respect than many of the retired Supreme Court Judges of recent times. He is known for his unconventional progressive views; the ‘Naz Foundation’ judgment speaks louder about his approach and outlook as a Judge. His tenure as the Chief Justice of Delhi High Court is marked by many important judgments, which include the declaration of office of Chief Justice of India under the ambit of RTI Act. The agenda of the Twentieth Law Commission was to review/repeal of obsolete laws, to deal with law and poverty, to review the system of judicial administration, to examine and suggest ways of improvement of the existing laws in the light of Directive Principles of State Policy, to examine the existing laws with a view for promoting gender equality, to revise and to remove ambiguities of the Central Acts of general importance, to repeal obsolete laws and to convey to the Government its views on any subject relating to law and judicial administration that may be specifically referred to it by the Government through Ministry of Law and Justice, to consider the requests for providing research to any foreign countries, and to examine the impact of globalization on unemployment, food security and recommend measures to protect the interests of the marginalized. Though there are many reports by the Law Commission during the Chairmanship of A.P Shah, some of the important ones are highlighted here. Based on the judgment in Public Interest Foundation & Others V. Union of India, the Commission worked specifically on ‘curbing criminalization of politics and needed law reforms’, ‘impact and consequences of candidates filing false affidavits and needed law reforms to check such practice and submitted its 244th report on Electoral Disqualification in 2014. This was widely discussed in its 255th Report. The 255th report of the Law Commission deals with Electoral Reforms in India and suggested comprehensive measures for changes in the law. The 245th Law Commission report dealt with the arrears and backlog of cases largely on poor judicial infrastructure. Law Commission suggested in creation of additional courts for speedy clearance of cases and deduction in costs. The 246th Report came up with large amendments to the Arbitration & Conciliation Act 1996. The reforms dealt with tacking issues of delay, costs, interim orders by tribunals, institutional arbitration, automatic stay of enforcement of arbitral awards etc. In its Report No.256 titled “Leprosy Affected Persons and the Laws applicable to them” undertook the task of identifying laws which can either be repealed or which need amendments in view of the existing climate of economic liberalization. The Commission recommended repeal of 288 obsolete laws. On a request from the Leprosy Mission Trust of India, the Commission conducted the study of repealing laws discriminatory towards people affected by leprosy. Report No.257 titled “Reforms in Guardianship and Custody Laws in India” emphasized the “welfare of the child” as the paramount consideration adjudicating custody and guardianship matters. The Commission discussed the Shared Parentage concept in India. The parentage system across the world was studied for the same, the views of the Commission was centered around strengthening the welfare principle in the Guardians and Wards Act, 1890, providing equal legal status to both parents with respect to guardianship and custody, providing detailed guidelines to help decision-makers assess and providing for the option of awarding joint custody to both parents. On the advice of the Prime Minister’s Office, the Prevention of Bribery of Foreign Public Officials and Officials of Public International Organizations was referred to Law Commission in July this year, to submit its recommendations. The proposed bill covered requirements of Article 6 of the United Nations Convention against Corruption. After extensive deliberation and discussion, Report No.258 titled “Prevention of Bribery of Foreign Public Officials and Officials of Public International Organizations – A Study and Proposed Amendments was laid by the Commission. Recognizing the importance and relevance of Early Childhood Development from the perspective of national and human resource development the Commission formed a Sub-Committee under the chairmanship of Prof. (Dr.) Mool Chand Sharma, Member, which, after several rounds of discussions and deliberations, came up with a draft Report on the issue finalized as Report No.259 titled “Early Childhood Development and Legal Entitlements”. To address the risks to international investment treaties in the absence of clear legal position, the Commission decided to take up the Draft Model Bilateral Investment Treaty by Government of India for study and after several rounds of discussions and deliberations, came up with several suggestions on specific clauses in the form of Report No.260 titled, "Analysis of the 2015 Draft Model Indian Bilateral Investment Treaty". Report No. 261 was on the “Need to Regulate Pet Shops and Dog and Aquarium Fish Breeding.” The report observes that pet shops and breeders violate provisions of animal welfare laws and recommends that it is necessary to regulate their practices. Reports suggest that these animals in pet shops are kept in terribly inhumane conditions and there are no regulations protecting them. The Law Commission of India had also held a one-day consultation on the death penalty on 11th July, 2015 at the India Habitat Centre in New Delhi. Four key themes were discussed at the consultation, i.e., Arbitrariness and Discrimination, State of the Criminal Justice System, The Penological Purpose of the Death Penalty and the Way Forward: Retention, Reform, and Abolition. The Court in the Bachan Singh Case had relied upon on the 35th Report of the Law Commission. According to J. Shah, it needs to be re-visited since it was submitted in 1967, and hence did not account for the over-hauling of the death penalty framework in the Code of Criminal Procedure, 1973. There are inconsistencies in the system and these changes in India make it an opportune moment to revisit questions of the constitutionality and desirability of the death penalty since the poor and downtrodden usually go to the gallows. Justice Shah also spoke at a lecture on 'Universal Abolition of Death Penalty: A Human Rights Imperative', which was organized by Law Commission of India in association with O P Jindal Global University (OPJGU) and National Law University. To make its presence more relevant, the Commission joined the Facebook and Twitter. The Commission has also created a YouTube Channel for reaching out. The Commission also adopted a new logo. According to Justice Shah the goal of the 20th commission was to prepare recommendations in the form of draft bills, instead of mere guidelines which will contributes a greater input to the entire legislative exercise undertaken by the government as well as by the Parliament. Elaborating the point, he says that the pattern of the work adopted in the Commission is to first hold an in-house meeting of the Commission members on the subject under reference from the government. The Commission then constitutes a cross-sector group comprising necessary expertise of national level from various fields involving professionals. Sometimes, the Commission prepares a consultation paper highlighting various issues and inviting suggestions and comments which are later analyzed. There are certain flaws that Justice Shah points at. He says that the funds allocated to the Commission are inadequate and there is even lack of resources which limits their general interaction with the public. Commission has a completely outdated library presently housed in the Indian Law Institute building. J. Shah states that the present tenure of the commission, i.e., three years, is insufficient time to conceive and implement the proposals of the Commission. 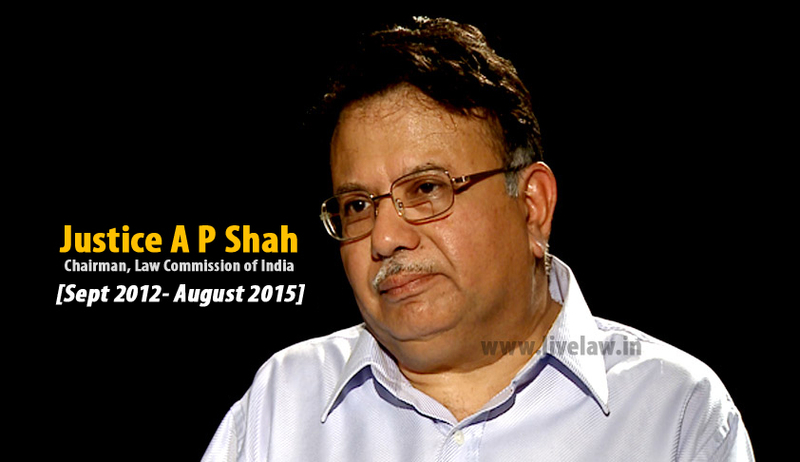 According to him, it is high time that the Law Commission of India should be given a statutory status.